If you have additional shipping questions or need answers on how long your order will take to arrive please call us 1-866-330-1272. Canadian Orders shipped from Mississauga, Ontario. Most orders are shipped the same or next business day. All orders are double checked before shipping in order to avoid shipping errors. Call us at 1-866-330-1272 for shipping times to your specific Postal Code. For Ground Shipping you never pay more than $8.92. 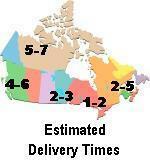 Southern Ontario and Quebec (Local and Regional) Next Business day to 2 days after your order ships. Shipping to anywhere in Canada is $8.92 flat rate for ground delivery. All Canadian orders are shipped from Mississauga, Ontario. Ground delivery is shipped with UPS to all delivery points that do not incur additional rural surcharges. If UPS charges additional rural surcharges then your order will be shipped with Canada Post using their Expedited service. Normal delivery times with UPS are Next Day-6 business days. Delivery times to super rural areas with Canada Post can take longer than 6 business days especially to some Northern Canadian delivery points. If you need an exact delivery time please call us at 1-866-330-1272. National 2-7 business days after your order ships except super rural areas which may take longer. See description at right for express shipping calculations. Also calculated at checkout. Southern Ontario and Quebec (Local and Regional) Express shipping is not typically any faster than Ground to Southern Ontario or Quebec. Call us to verify if you need express shipping. 1-866-330-1272. Express shipping is typically Next Business Day after your order ships to major centers and suburban areas and Next Business Day after your order ships to 2 business days to rural areas. Express shipping is shipped with UPS to all delivery points where there are no rural surcharges or reasonable rural surcharges. Those delivery points (mostly Northern Canada) where additional rural surcharges apply are shipped Xpresspost which is excepted to be delivered in 1-3 business days. If you need an exact delivery time please call us at 1-866-330-1272. The checkout will not allow you to express ship weights, balloon sticks, cups and/or ribbon. Call us in advance if you need those items express shipped and we will manually calculate your shipping costs. 1-866-330-1272. Tracking information is e-mailed to you the same day as your order ships. National Next Business Day after your order ships. Some rural areas are next day to 3 days after order ships. Pick Up Orders may be picked up at our warehouse in Mississauga Monday to Friday (9:30-6:30). However, because we are not a cash and carry warehouse orders need to placed online in advance of picking up the order. Shipping charges will be removed from the invoice once the order is picked up and shipping charges will be refunded. To pay with cash choose the pass along option at checkout. Please always put a note in the shipping comments that you will be picking up the order so that we have it ready for pick-up and so we do not ship the order. We accept cash and major credit cards at the warehouse location. We do not currently accept Interac. Taxes Canadian orders are charged GST or HST and PST where applicable. Returns You may return anything purchased for a full refund less shipping costs to ship to you as long as we receive notification of your intention to return goods within 30 days by e-mail. We reserve the right to refuse seasonal product, although in most cases we will not do so. Return instructions will be provided by e-mail once we respond to your intention to return goods. Goods must be returned in salable condition. We will not accept open packages. If you refuse an order and the order arrives within the stated delivery times for the chosen delivery method we will refund you the cost of your order minus our actual shipping costs to you and the actual shipping costs from you to us. Missing Products or Damaged Goods In order to avoid errors all orders are double checked before shipping. Before contacting us about missing products please thoroughly check the order. In most cases the missing product will be found. If we have made an error please e-mail us at . We pack all goods to avoid damages in shipping. If goods are damaged in shipping you need to notify us by e-mail within 3 days of receiving the goods so we can help resolve the matter. We only sell goods from quality manufacturers. The majority of our balloons are made in the U.S.A. with the exception of a few designs made in Europe or Mexico. Therefore, we are able to guarantee the quality of everything we sell. This guarantee is void where you do not use the proper mylar balloon inflator with automatic shut-off to blow up the foil balloons. We will replace or refund damaged goods at our discretion. Payment Methods We accept all Major Credit Cards including Visa, Mastercard, American Express and Discover. We also accept Paypal, Interac Money Transfer and direct bank transfers on larger orders. Purchase Orders are accepted from Schools, Hospitals, Non Profit Organizations and Major Corporations. E-mail us at for more details. Most orders are shipped the same or next business day. All orders are double checked before shipping in order to avoid shipping errors. Call us at 1-866-330-1272 for shipping times to your specific Zip Code. Orders under 1LB 1LB is approx 40 18" foil balloons or 2 bags of 100 Count 12" latex balloons. Delivered typically within 3-5 business days after shipping, but may take longer. Orders weighing under 1LB are shipped airmail post with USPS. Orders are typically delivered within 3-5 business days, but can take longer. Orders weighing less than 1LB do not come with guaranteed delivery times. If you need a smaller order delivered by a specific date please put a note in the shipping comment on your order. We will call and e-mail you if we do not think we can meet the delivery time. Orders over 1LB 1LB is approx 40 18" foil balloons or 2 bags of 100 Count 12" latex balloons. Orders weighing over 1Lb are shipped with UPS. Expected delivery times are 2-5 business days after shipping. Call us at 1-866-330-1272 for specific delivery times to your Zip Code. See description at right for express shipping calculations. Next Business Day after shipping. Express shipping is typically Next Business Day after shipping to anywhere in the mainland 48 states. Because there can be delays in delivery due to weather etc... you should consider the service a 2 day service although 99% of the time delivery is made next business day. Taxes There are no taxes charged at checkout to any mainland U.S. states. Returns You may return anything purchased for a full refund less shipping costs as long as we receive notification of your intention to return goods within 30 days by e-mail. We reserve the right to refuse seasonal product, although in most cases we will not do so. Return instructions will be provided by e-mail once we respond to your intention to return goods. Goods must be returned in salable condition. We will not accept open packages. 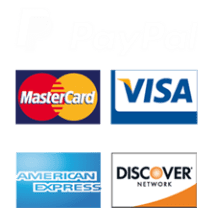 Payment Methods We accept all Major Credit Cards including Visa, Mastercard, American Express and Discover. We also accept Paypal and direct bank transfers on larger orders. Hawaii, Alaska, Puerto Rico, Guam, American Samoa, Virgin Islands, APO Boxes and other U.S. Territories. If you live in one of these states or territories please make sure to provide an address that can be delivered by USPS if the order is being shipped regular delivery or by UPS if being shipped express. (approx 80 18" foil balloons) 4-10 business days after shipping. Some territories and APO boxes may take longer. All orders to HI, PR, AK, Guam, other U.S. territories and APO Boxes are shipped airmail post. Typically delivery is 4-10 business days. Hawaii, Alaska, PR. Express delivery not available to other U.S. territories. See description at right for express shipping calculations. Next Business day to 3 business days after shipping. Express shipping is typically Next Business Day to 3 days after shipping to HI, PR, Alaska and VI. Taxes There are no taxes charged at checkout to HI, AK, PR, VI, Guam or any other U.S. territories or APO box customers. Returns You may return anything purchased for a full refund less shipping costs to as long as we receive notification of your intention to return goods within 30 days by e-mail. We reserve the right to refuse seasonal product, although in most cases we will not do so. Return instructions will be provided by e-mail once we respond to your intention to return goods. Goods must be returned in salable condition. We will not accept open packages. Orders to International Destinations typically take 1-2 business days to process. Smaller orders are shipped by airmail post which can take 1-4 weeks to deliver, but could take longer. Orders over 1KG (2.2LBs) which is approx 80 18" foil balloons are shipped with UPS and typically arrive within 2-7 business days. Certain products, such as weights, ribbon and most balloon accessories are not shipped Internationally. We have shipped to most countries in the world with very few issues. We have the most experience shipping to Singapore, Turkey, Australia, New Zealand and Europe. Every up to 1-2400 Grams after that. Add $24.50 Add $39.00 $39.00 $46.00 Due to too many frustrating customs issues we do not currently ship to Mexico. Customers wanting to ship direct to Mexico need to arrange shipping or have us ship to a U.S. border city and arrange shipping from there. For international orders over $2,500 please contact us for shipping rates. For larger international orders you may wish to use your own shipping company. Brokerage is paid when shipped by courier. However, any duty and taxes are the responsibility of the buyer and may incur collection fees. Please advise us of any special instructions required to help clear your goods through customs or reduce you other costs by providing instructions in the shipping comments when placing your order.